At Lavan Bridal, we carry a diverse collection of styles, from lavish gowns with elegant beading to simple gowns that gracefully accent the femininity of a modest bride. You envision your perfect dress and our designer brings it to life. You can select an existing gown or start completely from scratch and design it yourself. We look forward to creating the gown of your dreams. Get more for your wedding! 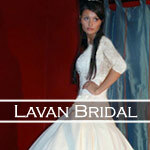 Don't forget to mention ChossonKallah.com when visiting Lavan Bridal.